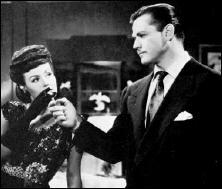 » Movie Review: PHILO VANCE’S SECRET MISSION (1947). 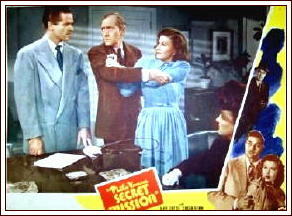 Movie Review: PHILO VANCE’S SECRET MISSION (1947). PHILO VANCE’S SECRET MISSION. PRC, 1947. 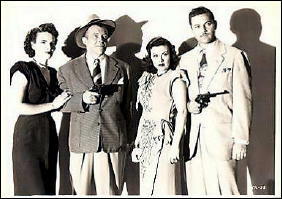 Alan Curtis (Philo Vance), Sheila Ryan, Tala Birell, Frank Jenks, James Bell, Frank Fenton, Paul Maxey. Screenplay: Lawrence Edmund Taylor. Director: Reginald Le Borg. I have three major complaints about the title of the film. First of all, handsome and dashing Alan Curtis does not fit the picture I have in my head of Philo Vance at all. Secondly, he’s not on a mission in this movie, and even if he was, it’s hardly a secret. So, scratch the title. What do you have left? Plenty, if you think murder mysteries ought to be filled with witty banter between the detective and the pretty girl (Sheila Ryan) who tags along with him as he questions suspects and investigates shots in a house in the middle of the night. Or not so witty banter between the detective and his not so witty sidekick (Frank Jenks), who only purpose in the movie is to — scratch that. I don’t think he had one, except to ogle good-looking women and pretend to one of them that he’s the real “detectative” of the pair. But to get back to the pulp magazine publisher, what he wants Vance to do is to write a story about a case he (the publisher) has solved — that of the disappearance and probable murder of a third partner of the firm seven years earlier. And of course he, the publisher, gets bumped off before he can tell Vance his theory of the case. There is a lot of foolishness that ensues, but there is at least one truly surprising turn of events that occurs before it all ends, in less than an hour’s total time, and an ending that’s at least decent from a perspective of a detective story fan, which I am assuming you are as well as I.
I’m told by IMDB, that of the three Philo Vance movies PRC made in 1946 and 1947 (with Alan Curtis in two of them) that this was the first to be filmed and the last to be released. I don’t know how that squares with Vance and his lady sidekick apparently heading to a wedding chapel at the very end of the film, but they do, and for some reason that tickled me as much as anything else in this movie. Philo Vance gets the B movie treatment. If you can divorce this from the actual character and imagine it is an episode of the Falcon it is much as Steve describes it, and one of a relative few films to use the pulps as a background. Considering its poverty row antecedents and cast this one is more fun than it ought to be, and Alan Curtis is a much better Vance than William Wright. But from KENNEL MURDER CASE to this. How have the mighty fallen? Makes you nostalgic for THE GRACIE ALLEN MURDER CASE. What was Vance’s secret mission? Surviving life on poverty row.